The Green Workplace: The beginning of the end for free carrier bags? 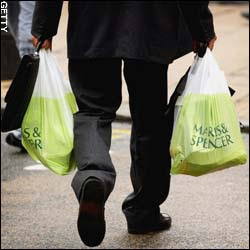 I know charging for carrier bags has been happening for a long time in other countries (i think it's pretty standard in Australia for instance) but it is only now that Marks & Spencer, probably the biggest name on the UK high street and high-end food retailing, announced that it is going to roll-out a 5 pence charge for food carrier bags in all of its UK stores. All profits generated from the charge will go to environmental charity Groundwork and be used to create or improve ‘greener living spaces’ such as parks, play areas and gardens in neighbourhoods around the UK. It is expected that around 40 neighbourhoods will benefit in the next twelve months. Let's hope that good old M&S are leading the way for other high street retailers and supermarkets alike! One positive step is that London Councils are currently pushing a Bill through Parliament that if legislated will ban outright the use of all throw-away bags in the capital. This follows a city-wide consultation with Londoners, in which 90 per cent of respondents called for action to be taken on plastic and other throw-away bags. It's often the way in the UK that a trend first occurs in London and then radiates out to the rest of the country; so I'll be keeping my fingers crossed that London sets a trend this time! I'd love to hear how charging for carrier bags is progressing in the US and other parts of the world... let me know! Click here for M&S's press release. IKEA offers a reusable package bag for $5.00. I bought one when first shopping at IKEA and now I use it all the time. It is strong, durable and will support a lot of weight. I can fold it up and keep it in my purse until I need it. I prefer reusable bags to the "plastic / recyle" bags most stores now provide. Several grocery stores in Omaha, NE are now selling reusable bags...they are very durable and are made of a canvas-type material. When the grocery clerk asks "paper or plastic" its nice to be able to say "no thank you, I've brought my own".